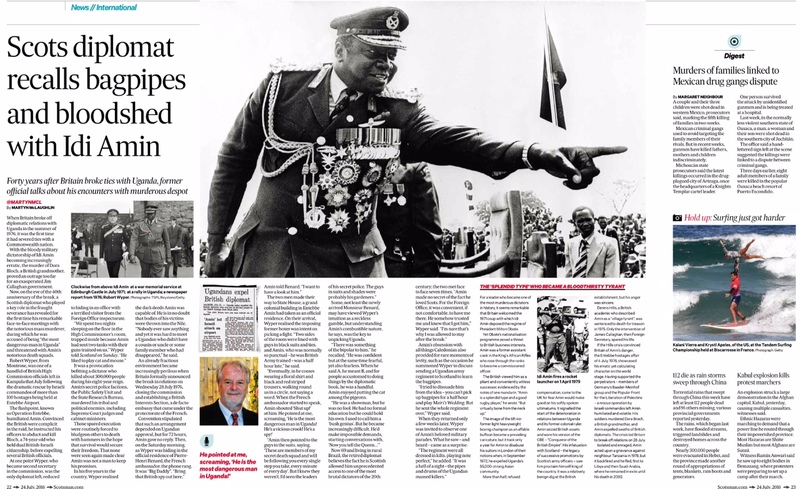 ‘Bagpipes and Bloodshed’, Scotland on Sunday – In July 1976, Britain broke diplomatic ties with Uganda, the first time it had ever done so with a Commonwealth nation. The decision was sparked by the increasingly erratic and bloody dictatorship of Idi Amin. The abduction and murder of a British grandmother proved the final straw and the British High Commission was closed. Only a handful of Britons remained in the country, among them diplomat Robert Wyper, originally from Montrose. It was he who was summoned to Amin’s sprawling presidential residence in the wake of the break. Forty years on, he recalled how Amin called him the “most dangerous man in Uganda.” It is rare to have anyone from the FCO speak on the record about their postings, particularly one as fraught as Kampala in the mid 1970s. WHEN Britain broke off diplomatic relations with Uganda in the summer of 1976, it was the first time it had severed ties with a Commonwealth nation. With the bloody military dictatorship of Idi Amin becoming increasingly erratic, the murder of Dora Bloch, a British grandmother, proved an outrage too far for an exasperated Callaghan government. Now, on the eve of the 40th anniversary of the break, a Scottish diplomat who played a key role in the fraught severance has revealed for the first time his remarkable face to face meetings with the notorious mass murderer, during which he was accused of being “the most dangerous man in Uganda” and threatened with Amin’s notorious death squads. Robert Wyper, from Montrose, was one of a handful of British High Commission officials left in Kampala that July following the dramatic rescue by Israeli commandos of more than 100 hostages being held at Entebbe Airport. The flashpoint, known as Operation Entebbe, humiliated Amin. Convinced the British were complicit in the raid, he instructed his officers to abduct and kill Ms Bloch, a 74-year-old who held dual British-Israeli citizenship, before expelling several British officials. At one point, Wyper, who became second secretary in the commission, was the only diplomat left, reduced to hiding in an office with a terrified visitor from the Foreign Office inspectorate. It was a provocation befitting a dictator who killed around 300,000 people during his eight year reign. Amin’s chillingly named secret police factions, the Public Safety Unit and the State Research Bureau, murdered his tribal and political enemies, including Supreme Court judges and cabinet ministers. Those spared execution were routinely forced to bludgeon others to death with hammers in the hope that survival would secure their freedom. That none were seen again made clear Amin was not a man to keep his promises. In his five years in the country, Wyper realised the dark deeds Amin was capable of. He is in no doubt that bodies of his victims were thrown into the Nile. “Nobody ever saw anything and yet it was hard to meet a Ugandan who didn’t have a cousin or uncle or some family member who had disappeared,” he said. An already fractious environment became increasingly perilous when Britain formally announced the break in relations on Wednesday 28 July 1976, closing the commission and establishing a British Interests Section, a de facto embassy that came under the protectorate of the French. The two men made their way to State House, a grand colonial building in Entebbe Amin had taken as an official residence. On their arrival, Wyper realised the imposing former boxer was intent on picking a fight. “Two sides of the room was lined with guys in black suits and ties, and Amin, who was normally so punctual – he was British Army trained – was a half hour late,” he said. “Eventually, in he comes wearing a floral shirt and black and red striped trousers, walking round us in a circle, not saying a word. When the French ambassador started to speak, Amin shouted ‘Shut up!’ at him. He pointed at me, screaming, ‘He is the most dangerous man in Uganda! He’s a vicious crook! He’s a spy!’. Some, not least the newly arrived Monsieur Renard, may have viewed Wyper’s intuition as a reckless gamble, but understanding Amin’s combustible nature, he says, was the key to unpicking Uganda. “There was something of the bipolar to him,” he recalled. “He was confident but at the same time fearful, yet also fearless. When he said A, he meant B, and for people accustomed to doing things by the diplomatic book, he was a handful. Amin enjoyed putting the cat among the pigeons. Now 69 and living in rural Brazil, the retired diplomat believes the fact he is Scottish allowed him unprecedented access to one of the most brutal dictators of the 20th century; the two met face to face seven times. Amin’s obsession with all things Caledonian also provided for rare moments of levity, such as the occasion he summoned Wyper to discuss sending a Ugandan army regiment to Scotland to learn the bagpipes. “I tried to dissuade from the idea – you can’t pick up bagpipes for a half hour and play Marie’s Wedding. But he sent the whole regiment over,” Wyper said. When they returned only a few weeks later, Wyper was invited to observe one of Amin’s beloved military parades. What he saw – and heard – came as a surprise. For a leader who became one of the most murderous dictators in history, it seems incredulous that Britain welcomed the 1971 coup with which Idi Amin deposed the regime of President Milton Obote. The image of the 6ft 4in former light heavyweight boxing champion as an affable buffoon became a prevailing caricature, but it took only a year for Amin to disabuse his suitors in London of their notions when, in September 1972, he expelled Uganda’s 55,000-strong Asian community. More than half, refused compensation, came to the UK for fear Amin would make good on his softly-spoken ultimatums. It signalled the start of the deterioration in relations between Uganda and its former colonial ruler. Amin seized British assets and wore his version of the CBE – “Conqueror of the British Empire”. His infatuation with Scotland – the legacy of successive promotions by Scottish army officers – saw him proclaim himself king of the country. It was a relatively benign dig at the British establishment, but his anger was sincere. Dennis Hills, a British academic who described Amin as a “village tyrant,” was sentenced to death for treason in 1975. Only the intervention of a strategically obsequious James Callaghan, then Foreign Secretary, spared his life. If the Hills crisis convinced Britain of Amin’s danger, the Entebbe hostages affair of 4 July, 1976 showcased his erratic yet calculating character on the world stage. Having supported the perpetrators – members of Germany’s Baader-Meinhof group and the Popular Front for the Liberation of Palestine – a rescue operation by Israeli commandos left Amin humiliated and volatile. His soldiers murdered Dora Broch, a British grandmother, and Amin expelled swaths of British diplomats. The crisis led Britain to break off relations on 28 July. Isolated and enraged, Amin acted upon a grievance against neighbour Tanzania in 1978, but it backfired and he fled, first to Libya and then Saudi Arabia, where he remained in exile until his death in 2003.